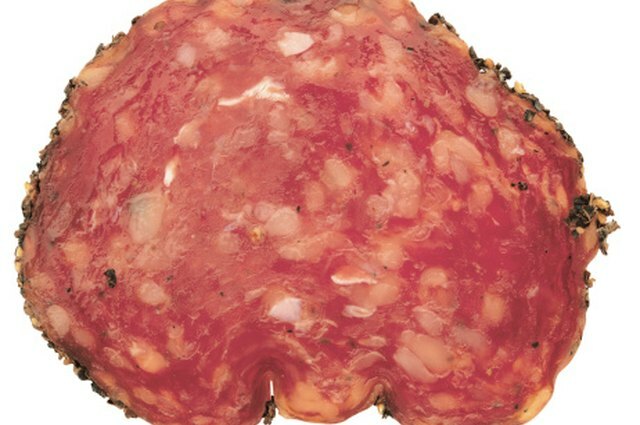 Pepperoni, according to Dictionary.com, is defined as "a highly seasoned, hard sausage of beef and pork." It is dried, fine-ground and usually lightly smoked. Individual recipes for pepperoni may vary, but most include some form or combination of red pepper (paprika, cayenne or crushed red pepper) and black pepper, as well as garlic. Other spices can be added depending on taste. 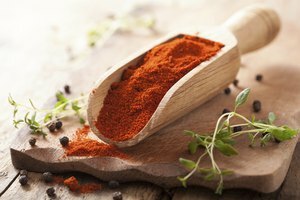 Paprika, a powder ground from paprika peppers, can be smoked, sweet, semi-sweet or hot. 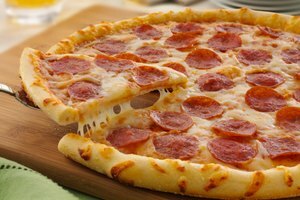 Any or all of these varieties can be found in pepperoni. Paprika also helps to give pepperoni its signature reddish-orange color. Ground black pepper can be found both in the pepperoni meat and sometimes surrounding the log itself. It adds a pungent flavor and aroma and a bit of heat. Garlic adds a different type of pungency to pepperoni and helps to balance out the peppery flavors. Usually it is introduced to the meat in the form of garlic powder as opposed to fresh cloves of garlic. Mustard adds a sharp, tangy flavor to pepperoni. It can be used in the form of mustard powder or seeds, which are coarsely ground or crushed to provide texture. Fennel seed is mildly aromatic and has a taste reminiscent of anise or licorice. It is an ingredient in many Italian-style sausages, including pepperoni. It can be ground to a fine powder or coarsely crushed to maintain some texture. Flakes of crushed red pepper can be added whole or coarsely ground to pepperoni. As crushed red pepper usually contains seeds as well as dried chile flakes, it can be quite hot. Cayenne is used to add heat to pepperoni. 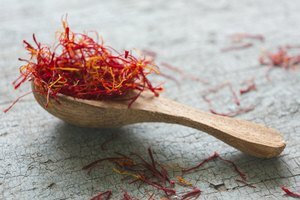 It is the hottest, most intense spice used, so some recipes omit it to make a milder sausage. Cayenne has a pungent bite to go along with its searing heat. What Is the Difference Between Kielbasa & Smoked Sausage?